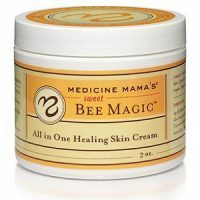 This is a review of Medicine Mama’s Organic Apothecary Sweet Bee Magic, which is manufactured in the company’s “boutique apothecary” to deliver a pure, organic multipurpose skin cream. Among its many uses listed by Medicine Mama, including soothing itchy skin, relieving the pain of cuts and scrapes; relieving chronic conditions that cause dry, irritated skin; soothing sunburn and insect bites; and simply helping to maintain healthy, radiant, youthful-looking skin. It is also said to heal scars along with burns, rashes and intense skin irritations. What’s in Medicine Mama’s Sweet Bee Magic? Organic Extra Virgin Olea Europaea (Olive) – olive oil with its essential fatty acids, penetrates and hydrates the skin. Organic Cera Alba Beeswax – soothes and protects the skin from dryness by creating a protective layer over the skin, but without preventing it from breathing. Propolis – produced by bees, it is thought to have antibacterial, antiviral, antifungal and anti-inflammatory properties. Bee Pollen – a source of many vitamins and minerals, it stimulates the blood supply to the skin, speeds up the healing process and reduces the appearance of wrinkles. Royal Jelly – very rich in biotin and pantothenic acid, it is said to regenerate cells and tissues, promoting new skin growth; and also increases skin hydration. 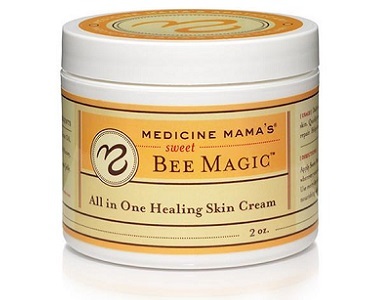 How Do You Use Medicine Mama’s Sweet Bee Magic? If you want to use Medicine Mama’s Organic Apothecary Sweet Bee Magic for moisturizing protection or for overnight skin nutrition, you should apply a generous amount to your hands, face and body before going to bed or as needed. For the relief of minor cuts, scrapes, burns or irritations, just place a small dab on the affected area. Medicine Mama sells a 2oz jar for $24.99 directly from its website. However, we found the product at a lower price on other online retailers – so do shop around. There is also a 4oz jar that you can purchase from the manufacturer for $39.99. The Medicine Mama website says that you can return your purchase with your original invoice – or with your name and shipping address if you don’t have the invoice. However, it does not indicate whether this would result in a full refund; nor does it state whether there is a time frame in which the return should be made. This product is not cheap, but it does come with glowing reviews on the Medicine Mama website as a multipurpose (mainly moisturizing and soothing) cream. However, if you plan to purchase Medicine Mama’s Organic Apothecary Sweet Bee Magic as a treatment for scarring, you might be disappointed. 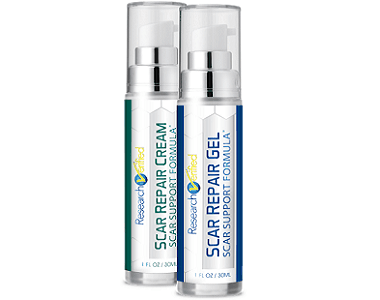 Although Medicine Mama lists the treatment of scars as just one of its many uses, there is no indication of how this is achieved; nor do any of its listed ingredients have any specific scar-prevention or treatment properties.